The Submersion Playlists bonus is published. All Submersion participants now have access to it in the Submersion portal. There are 15 different playlists to choose from, each containing 8 to 16 of the 60 core lessons. This gives you another way to explore the material, especially when you’d appreciate a refresher in one or more areas after completing the full course. The last two playlists include the 10 shortest lessons for when you’d love a quickie (most are under 15 minutes), and the longest lessons for when you’re craving a deeper lesson (most are over 35 minutes). Text transcripts for lessons 1-16 are published too, and transcripts for lessons 17-24 will be added soon. We’ll continue adding more transcripts until all 60 lessons are transcribed from audio to text, so you have multiple ways to engage with the material. And there are several more bonuses to be added as well, including the Submersion Summary Guide and the Subjective Reality Explorer’s Guide. Submersion members will receive these bonuses automatically as soon as they’re ready. A real experiment based on a previous thought experiment from Nobel Prize winning physicist Eugene Wigner was recently performed. The result demonstrated that we don’t live in a single common objective reality that we all observe the same way. The experimenters observed two different but conflicting realities from a 6-photon experiment. Perhaps you don’t just see reality differently than others do. Perhaps you are indeed living in a unique and different reality. Lesson transcripts are being added to Submersion this month. The first transcript for lesson 1 has already been published to the Submersion portal. Many more will follow in the weeks ahead until we’ve published all 60 lesson transcripts. These transcripts are only being lightly edited, so they’re essentially word for word transcriptions of the audios, which can be nice for those who’d like to review the lessons as text. I estimate that Submersion’s transcripts will total around 250,000 words when they’re completed, so it’s a substantial amount of material. It’s easily digestible in audio form though since it’s only 26 minutes per day on average. For the ebook version of Deep Abundance Integration, we’re editing the content a lot to make it flow better in written form, which is considerably more work. I anticipate that we’ll have the first volume of 10 lessons published sometime next week. It’s coming in around 65,000 words presently (just for volume 1), but we’re still doing some editing on it. There’s a lot of overlap between Submersion and Deep Abundance Integration participants. Most people who take one course are also signing up for the other. Some have shared that when they’ve finished one course, they want to continue the journey. Our main focus for the rest of this month is to continue creating and publishing more supporting material for these two courses. I expect that these courses will likely still be available 10-20 years from now since the content of both is timeless and universal. So far people from about 70 countries are currently participating, which is great to see. I’m really enjoying creating these long form courses since it provides the opportunity to explore a topic very deeply and to do so with the most interested people. Today I recorded and posted 5 more Submersion lessons (#26-30), so half of the core 60-day course is now published. 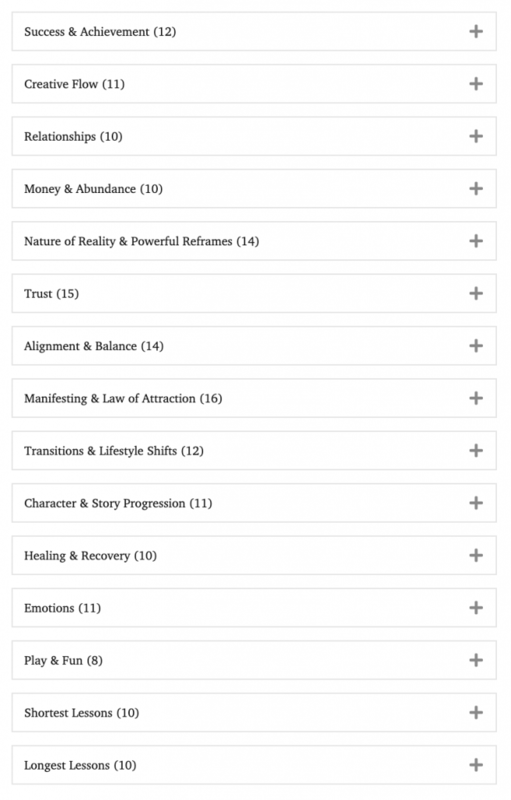 We’re right on schedule to have all 60 lessons published by Jan 31st. We also passed 500 sign-ups (currently at 504). This co-creative approach is still working well with a steady stream of daily feedback coming in. By the time I’ve published a new batch of lessons, there’s enough feedback on the previous ones to inspire ideas for the next batch. The results people have been sharing along the way are powerful yet wildly unpredictable; this exploration is so different for each person. I’m still wrapping my head around this type of group online exploration, which was an experiment for me as well. Instead of creating a course and then launching it, we launch it first and then co-create it experientially with the people who sign up for it. This approach aligns eerily well with what we’re covering in the Submersion course too. It’s stretching me to lean into more trust, courage, and cooperative creativity. Creative work flows through me every week, but I don’t feel like I’m controlling it. It feels like the course has a mind of its own, and I’m serving as a vehicle to facilitate its manifestation. Creating a course for 500+ committed deep divers is very different than creating it solo and then releasing it when it’s 100% done. In some ways this co-creative approach is easier because I’m fueled by all the social energy; that aspect can be creatively stimulating, inspiring, and rewarding. However, maintaining overall life balance during this time feels more difficult. It’s like being inside a creative tunnel where it’s difficult to pay attention to anything else. The nature of this particular exploration into the matrix-like nature of reality can lend itself to a bit of obsession as well. The past 4 weeks have felt almost unreal at times – so much growth and change packed into such a relatively short stretch of time. Part of me wants to pause, process what’s been happening, and try to make sense of it while another part wants to keep flowing with this surge of creative energy. Even sharing this quick update is giving me an idea for another lesson to design, almost like instructions are being downloaded, and I have to go transcribe them. This type of co-creative energy is a strange animal… wild yet disciplined, obsessive yet patient, chaotic yet structured. It works amazingly well, and someday I’d like to understand why. In fact, diving into Submersion is partly inspired by the desire to deepen my understanding of this type of energy flow. Today I added a convenient login link to the footer of every page of the public website, so if you’re enrolled in either the Deep Abundance Integration or Submersion courses, you can easily login to your account without having to remember or bookmark the login link. Just visit any page of the StevePavlina.com website, scroll to the bottom, and you’ll find the login link in the footer. Easy! You can also access the login link from the Courses menu at the top of any page of the site. Perhaps even easier! These courses have been super popular with hundreds of people enrolled in each one (Deep Abundance Integration is approaching 1000 sign-ups, and Submersion is coming up on 500), so we’re definitely going to create and launch more courses in 2019. This co-creative model is working incredibly well, and your input really does shape the direction of each course, not just for yourself and the other participants going through it as we create it, but for everyone who enrolls henceforth, even years or decades later. Submersion has 22 out of 60 lessons published so far, with more being added each week. So there’s still time to participate in the co-creative phase of this deep dive if you wish. It will be fully complete by January 31, 2019. The feedback on this one has been absolutely stellar, and most people are less than 10 days into it. More lessons will be published this coming week. A few people requested that the audio version of the recent free Subjective Reality course be made downloadable, not just streamable. As you wish! I’ve added download links to each page of the course, right below the audio player. This includes the invitation for the 60-day Submersion deep dive too. I also published 5 more lessons for Submersion yesterday, bringing us to 17 lessons total with 43 more to be co-created with the group. Several more people joined yesterday and today, bringing us to 483 co-explorers. It’s great to see that so many people are interested in exploring Subjective Reality together. The new 60-day Submersion deep dive experience attracted 477 sign-ups during its first week. This deep dive is well underway already with 12 lessons already in the portal, and I intend to publish more by Saturday, December 15. All lessons will be published by January 31, 2019. Submersion’s audio lessons are about 20 minutes per day on average. The main idea is to practice the subjective lens (viewing reality as if you’re in a simulation or a dream world) for a full two months, so you can gain practice, experience, and consistency. Presently I have dozens of emails to read regarding the course, so I’ll be catching up on those today and taking lots of notes. We’re co-creating this experience with the people who are exploring it together, and I listen carefully to the feedback and questions that people share along the way. Then I use this feedback to help design future lessons. So this deep dive is always adapting to the people who are going through it. If you join and share feedback along the way, everyone’s experience will turn out differently because of that. So you have a powerful say in what the deep dive becomes. This deep dive is the most introverted and introspective one so far. There’s no social aspect to it. It’s about focusing on your private hero’s journey and especially how that plays out through your relationship with reality. This is about training up your skill level. I enjoy this approach much better than trying to create a program entirely on my own and then releasing it and hoping it lands well with people. I feel a stronger creative flow when hundreds of people are involved and holding the intention for a positive, transformational outcome for all involved. I enjoy knowing and feeling that this is a team project – and that we’re aligning our intentions and energy to up-level each other and to create positive ripples beyond the deep dive. If you aren’t familiar with Subjective Reality yet, I recommend watching the 3-part Subjective Reality video course first. It’s free (no opt-in required), so you can start watching it right away. It will bring you up to speed and give you a clearer sense of the beginner, intermediate, and advanced phases, so you know what to expect as you explore this space. Each video in the series shares problems and challenges that people experience along the way… and their solutions. So far 2359 people have started watching the free series within the past week. It’s two hours long, so you don’t have to watch it all at once. Just begin it.